The most comprehensive of US Stamp Albums is the Scott National Album. This album is for the collector that is "serious" about completing a U.S. stamp collection, and it has spaces for just about every major variety listed in the Scott Specialized Catalog of United States Stamps, including the Postmaster's Provisionals and Special Printings. The binders and pages are sold separately. The basic album is sold in page groups, as follows: 1845 - 1934, 1935 - 1976, 1977 - 1993, 1994 - 1999, 2000 - 2005, 2006-2009 (annual supplements for the later years). The basic album pages, with four three-ring National binders, and four slipcases, retails for about $500. The basic pages include all Postmaster Provisionals, Air Mail, Special Delivery, Airpost Special Delivery, Registration, Certified Mail, Postage Due, Parcel Post, Special Handling, Parcel Post Postage Due, Offices in China, Official Stamps, Newspapers and Periodicals, and Confederate States, and supplements are issued each year, to keep the album up-to-date. The Album is customizable, as well. Say you just want to collect the classic issues from 1845 - 1934, or just want to collect modern issues from 1935 to date. You can buy only the pages you need, and the number of Scott three-ring binders and slipcases to accommodate them. This would be much cheaper than buying the entire album kit, if it suits your needs. Pages for Revenues and Envelope Cut Squares are available through various sellers on the Internet at additional cost. 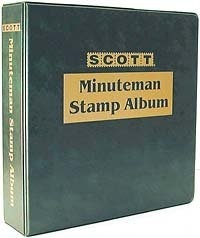 For an entry level collector, or for someone that doesn't require something as fancy or comprehensive as the National US Stamp Album, an excellent alternative is the Scott Minuteman US Stamp Album. This is a SERIOUS stamp album, with spaces for most every major variety of U.S. stamp, with the exception of the Postmaster's Provisionals, Special Printings, etc. This album also features historical information below each stamp space, which makes it a history book, as well as a first class U.S. stamp album. The album pages, with two three-ring binders, retail for around $100. 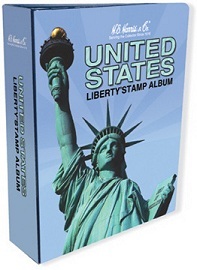 Another excellent US Stamp Album is the Harris Liberty Album. This is another very nice album, on par with the Scott Minuteman. Like the Minuteman, the Liberty U.S. 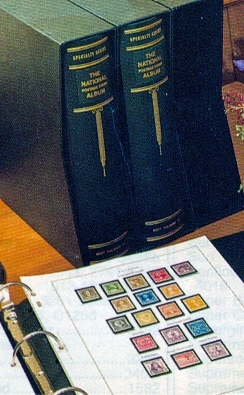 Stamp Album includes historical information below each stamp space. The album pages come in two two-post binders and the complete kit retails for about $90. White Ace also makes color album pages for US stamps. They are not as comprehensive in content as the Scott and Harris album pages, but they are beautiful, and should suit the interests of the basic US stamp collector. They are available in different subjects and year groupings and can be found easily on the Internet. The pages can be used in any three-ring binder, as well, though White Ace does make specialty binders for their pages, which are sold separately. There are other high quality foreign-made albums, such as Schaubek, a hingeless album at about $1,500, Davo hingeless album at about $750.00, SAFE hingeless album at about $2,800, Lindner hingeless album at about $2,000, and Lighhouse hingeless album at about $1,000. These are very luxurious albums, but they are not as comprehensive as the three albums noted above. The Scott and Harris US Stamp Albums are by far the most widely used among US stamp collectors. There are other, less expensive, albums available, but they are geared more towards the beginning collector. You can find them all on the Internet. If you don't mind a previously used album, you can occasionally find a cheap US collection that comes with one of these albums at auction or online on eBay. It may not be up-to-date, but you can get a nice album and maybe even some stamps this way for just a few dollars. Be careful, if buying older, used albums, expecting to upgrade them with new page additions, as they may not be compatible. The older Scott National binders have rectangular two-post binders, and the pages are cut that way. The older Minuteman albums had two-post binders, and those pages are cut to fit a two post album. The newer albums have thee-ring binders, and their pages are cut to fit these binders only.